Hello, my name is Michelle, and I’m addicted to television. Actually, I’m addicted to TV shows; but these days I watch most of them on my computer, not a television. My obsession began in my early 20’s. I was newly married and starting a family, and my husband was gone many evenings running our church’s Sports Ministry. I also spent copious amounts of time nursing and rocking babies, folding mountains of laundry, and playing with blocks with my toddlers. The TV kept me from getting bored, pretty much all day, every day, and again in the evenings when hubby left. As my children grew older and were more captivated by television, and when eventually they started school (at home), I rarely watched TV during the day. So my habits have changed, but my addiction has not. I save all mindless and boring tasks to do while watching shows, so that I don’t feel too guilty about it. So folding laundry, paying bills, cleaning the kitchen (which is where my desk and computer are), and chopping veggies are all accomplished while watching TV shows. It’s a very productive system. Now, in the summer, when all “my shows” are on hiatus, I have to get creative. During the last several summers, I’ve watched entire series that I never caught the first time around. Which brings me to my title reference. This summer, I watched “Gilmore Girls.” I didn’t watch it when it was on the air, though I remember the buzz about it being annoyingly quirky. 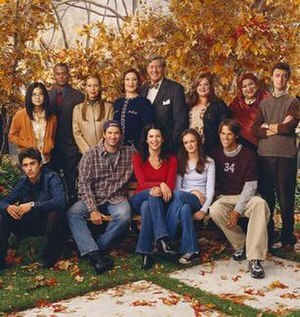 If you aren’t familiar, the show is about Lorelai and her daughter, Rory, who live in a quaint and stereotypical small town, called “Stars Hollow.” Lorelai became a mother at a very young age, and she and Rory are more like best friends than mother and daughter. This show enchanted me from the very first episode. The dialogue was quick and funny, though sometimes impossibly witty (really…..no real person’s brain works that quickly!). The characters were colorful, varied, and engaging. I fell in love with the whole thing. I was truly, and disproportionately, disappointed when, at the end of the series, Rory didn’t end up with “bad boy” Jess, played by Milo Ventimiglia. Perhaps that’s because I already knew him as Peter Petrelli on the show “Heroes.” He was a real superstar on that show, and I think perhaps I was subconsciously rooting for Peter even more so than Jess. When I finished the series, it was a huge let down. Not just because Jess didn’t show up at the end and sweep Rory off her feet. But because watching an entire series in such a short time is akin to reading a fabulous book. When I finish a book that I LOVE, I feel like someone I know has died. I’m invested. I’m obsessed. I feel that I’m part of their world. And it’s hard to say goodbye. So I’m missing Stars Hollow. I’m sure there are some that would scoff at my TV addiction and insist I need to be rehabilitated. That’s ok. I’m not offended by that. It’s my entertainment of choice, mostly because I can’t read while I’m folding laundry. 🙂 I’m going to need some suggestions, though, for next summer. What is your all-time favorite, feel-good television series? If I haven’t seen it yet, I’ll put it on my list.